It is not widely known that, in the early 18th century, ballroom dancing (duets by a man and a woman) reached a height of sophistication probably not seen again until the 20th century. These dances were, of course, very different to their modern counterparts. The couple danced side by side, performing the same steps and floor patterns often in mirror image. They did not touch except occasionally to take hands. The only one of these dances still known today (although it is widely misunderstood) is the minuet, which dominated the ballroom for around 100 years from the late 1600s to the late 1700s. However, there were also the ‘danses à deux’ or ‘double dances’, many of which were created for important occasions at court and then more widely disseminated through their publication in notation. These appeared over a shorter period, roughly the first third of the 18th century. A handful of choreographies became so famous that they were danced throughout the 18th century and are referred to many times in contemporary writings. Beauchamp-Feuillet notation, the system developed at the court of Louis XIV in the 1680s, published in 1700 and used to record these ballroom duets, will be the subject of a later post. The duets themselves have been catalogued by Meredith Little and Carol Marsh in La Danse Noble (1992) and by Francine Lancelot in La Belle Dance (1996). The danses à deux use the steps, style and technique of what is now recognised as an early form of ballet. They range over a variety of different dance types – the saraband, the loure, the passsepied, the bourée, the rigaudon, the English hornpipe among others. Some of them bring together two or more dance types within their choreographies. Although they vary in difficulty, some are as complex as stage dances while others are short and simple, even the most straightforward of these duets require much practice if they are to be performed with the requisite skill and ease. There has been much disagreement over the appropriate style and technique for these dances, not least because the original sources can be obscure and contradictory. That, and the need for would-be dancers to have had some formal dance training as well as the time and patience to practise, has deterred most from learning these choreographies. They are currently rarely taught or performed in the UK. Most people, even those closely concerned with dance or dance history, will never have seen them. Yet, these duets provide a window onto a vanished world of dancing. They are an integral part of the history of dance. As well as looking in detail at the ballroom minuet, I will analyse individual choreographies and pursue the stories behind them in future posts. The illustration shows where these ballroom duets began. 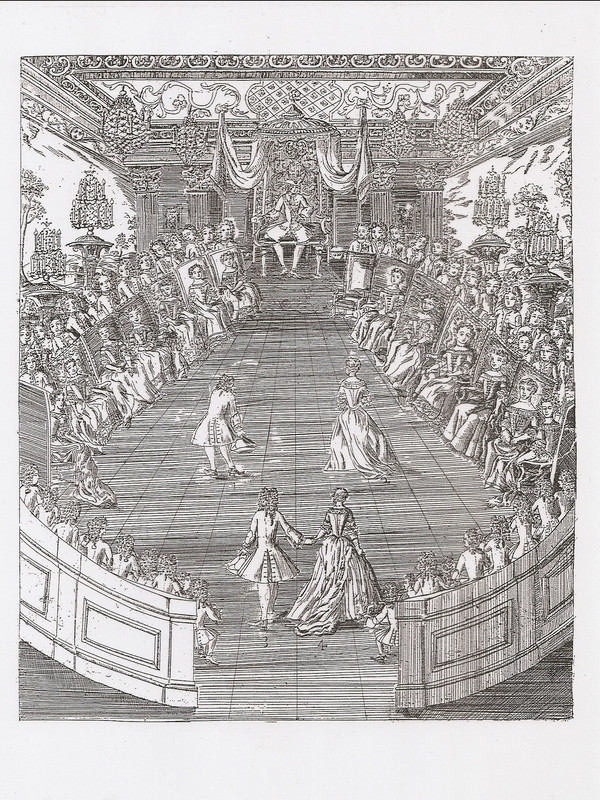 A ball at the court of Louis XIV. Pierre Rameau. Le Maître à danser (Paris, 1725). This entry was posted in Ballroom Dancing, Dancing at Court, The Minuet and tagged Baroque Dance, Louis XIV on March 2, 2015 by moiragoff.